I would love to just fall down and leave this blog post at that, BUT... 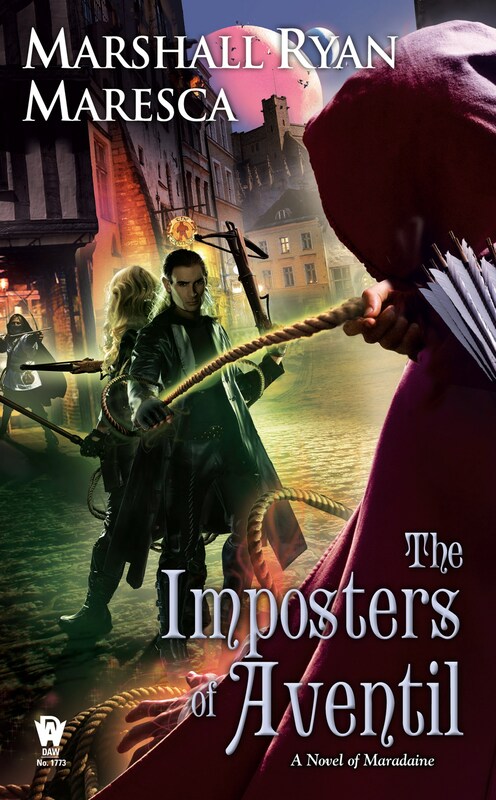 The Imposters of Aventil will be released in a mere eight days. It's funny, because I said a while ago I commented on how the New Release thing would never get old, and while it doesn't... it's no longer this momentous event of panic. I know the steps to this dance now. But it means I've got to write some guest posts and a few other things to get my ducks in a row for the release. 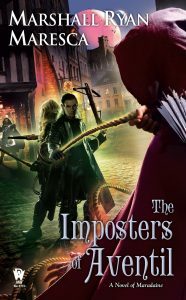 But, in the mean time, you can still pre-order The Imposters of Aventil, the book the Tenacious Reader says, "carries forward with the fun and excitement I’ve come to expect from the Maradaine series" and SF&F Reviews calls "a sharply observed investigative thriller in a mature and well crafted fantasy world". So, this past weekend I taught the worldbuilding class with Amanda Downum, and I felt it went rather swimmingly. And the students seemed pleased with it as well, so all went well. It's the sort of thing I enjoy doing, and I hope to get more opportunities in the future. Are you still reading steampunk? Is there still an audience of readers? Many steampunk folks enjoy the costumes and cons and parties but are they reading steampunk? Guilt and vengeance have always been a motivation in fiction - from Shakespeare all the way to Harry Potter. Tragic death may start a hero's journey, but what is the basis for this? Is it merely a tried-and-true trope of the writer's toolbox, or can it actually lead to enlightenment for the character instead of more death and tragedy? One, Two, Three, Four Can I have a Little More? Your favorite series ended at 3 books and you want more. Your favorite movie stopped at 4 but you need more. Authors have obliged and now your series is up to 18 books. Your movie has now had 3 remakes with 3 movies each. How many books should a series go before it jumps the shark? How long should you wait for the next one? Harry Potter is 20, well the books are. How timeless are the books? Are you reading them to your children/grandchildren? Where is the Harry Potter Franchise headed? Are you looking forward to Prequel movies and more books around the cauldron! What do you think I should read from? Preview for Imposters? Special sneak from Lady Henterman’s Wardrobe? Or do I just play Freebird? Sometimes I'm just amazed at the speed things have gone with my writing career. A few months ago, I was interviewed by the Austin Chronicle (with a whole lot of other great Austin SFF writers), and the interviewer, who's known me from the playwriting days, said, "All of a sudden, you have all these books!" And while, for me, this has been a long challenging road, now that it's fully underway, it feels a freight train. 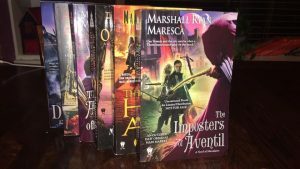 So now here we are with THE IMPOSTERS OF AVENTIL, the third Novel of Maradaine, and the sixth book of the Maradaine Sequence. A whole lot of time, energy and planning went into all of these books, setting up the dominoes, and now we're getting to the first big payoff, where the Thorn meets the Maradaine Constabulary. Putting Minox and Satrine in the same book as Veranix was a thrill to write. IMPOSTERS also marks the midway point of what will, hopefully be Phase I of the Maradaine Sequence. After this, of course, we've got Lady Henterman's Wardrobe coming up in March, and A Parliament of Bodies later next year, and then the next four books I have planned, which I hope to be telling you more about in the near future. 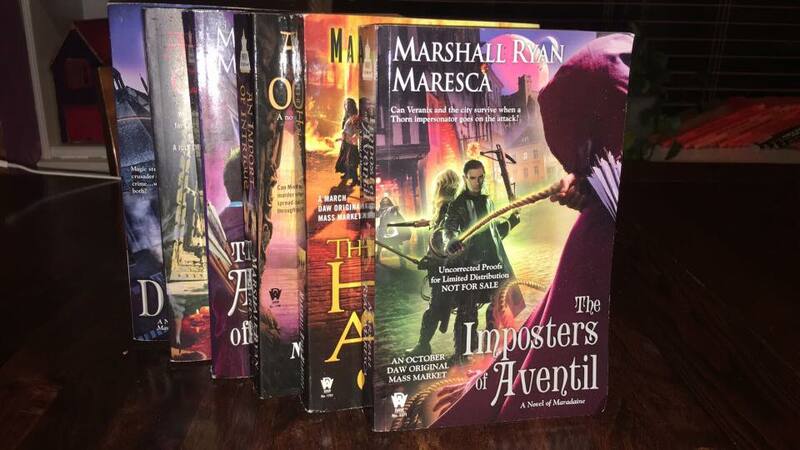 Until then, though, there's still time to catch up on the Maradaine and Maradaine Constabulary books, and pre-order The Imposters of Aventil, so you're ready to jump in when it comes out next month.